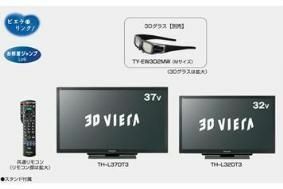 JAPAN: Panasonic, Sony launching smaller 3D TVs | What Hi-Fi? Two models will be available: a basic model at just under £1300, or an upgraded version with enhanced sound quality at around £1450. Panasonic's new 3D line-up stretches from 32in and 37in LED-lit LCD models, at about £1350 and £1520, right up to premium plasmas. The eight new plasma TVs will include both basic models and flagship TVs claiming stronger black levels even in bright light. They will range from 42in to 50in, at prices from around £1200 to over £3000. The Panasonic LCD models use a new fast response IPSα panel, which has changes to both the liquid crystal layer thickness and the liquid crystal material itself to give a response time said to be twice as fast as that in current models. In combination with new high-speed panel drive, this is claimed to give a response time of just 2ms, improving the 3D effect by minimising crosstalk. Panasonic's new plasma models use a variety of technologies including new panels and Deep Black Filter II, said to give a 1.4-fold increase in black depth, 3D Depth Controller to allow the viewer to vary the extent of the 3D effect, and 3D Cinema Smoother to improve the stereoscopic image. Models in the new range also include 2D-to-3D conversion, and automatic 3D format recognition. Panasonic, like other Japanese manufacturers, is expecting this year's domestic-market TV sales to slump to around half of 2010 levels, as current incentive schemes run out, and Japan completes its switchover to digital broadcasting in July this year. Currently 3D sets account for just 12% of Panasonic's sales of 40in+ TVs, but the company expects that figure to rise as high as 90% in the next financial year.